1. Unmatched characteristics of C.T.s : Though the saturation is avoided, there exist difference in the C.T. characteristics due to ratio error at high values of short circuit currents. This causes an appreciable difference in the secondary currents which can operate the relay. So the relay operates for through external faults. This difficulty is overcome by using percentage differential relay. In this relay, the difference in current due to the ratio error exists and flows through relay coil. But at the same time the average current ( I1 + I2/2) flows through the restraining coil which produces enough restraining torque. Hence relay becomes inoperative for the through faults. 2. Ratio change due to tap change : To alter the voltage and current ratios between high voltage and low voltage sides of a power transformer, a tap changing equipment is used. This is an important feature of a power transformer. This equipment effectively alters the turns ratio. This causes unbalance on both sides. To compensate for this effect, the tapping can be provided on C.T.s also which are to be varied similar to the main power transformer. But this method is not practicable. The percentage differential relays ensure relays ensure the stability with respect to the amount of unbalance occurring at the extremities of the tap change range. 3. Difference in lengths of pilot wires : Due to the difference in lengths of the pilot wires on both sides, the unbalance condition may result. The difficulty is overcome by connecting the adjustable resistors in pilot wires on both sides. These are called balancing resistors. With the help of these resistors equipotential points on the pilot wires can be adjusted. In percentage differential relays the taps are provided on the operating coil and restraining coil to achieve balance. 4. Magnetizing current inrush : When the transformer is energized, the condition initially is of zero induced e.m.f. and it is similar to the switching of an inductive circuit. Due to this the transient inrush of magnetizing current flows in to the transformer. This current is called magnetizing current inrush. This current may be as great as 10 times the full load current of the transformer. This decays very slowly and is bound to operate differential protection of the transformer falsely. a. Size of the transformer. c. Type of magnetic material used for the core. d. The amount of residual flux existing before energizing the transformer. e. The method by which transformer is energized. If the transformer is energized when the voltage wave is passing through zero, the magnetizing current inrush is maximum. At this instant, the current and flux should be maximum in highly inductive circuit. And in a half wave flux reversal must take place to attain maximum value in the other half cycles. If the residual flux exists, the required flux may be in same or opposite direction. Due to this magnetizing current inrush is less or more. If it is more, it is responsible to saturate the core which further increases its component. This current decays rapidly for first few cycles and then decays slowly. The time constant L/R of the circuit is variable as inductance of circuit varies due to the change in permeability of the core. The losses in the circuit damp the inrush currents. Depending on the size of the transformer, the time constant of inrush current varies from 0.2 sec to 1 sec. 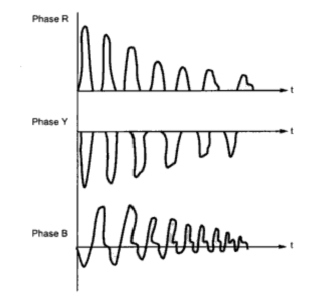 The waveforms of magnetizing inrush current in three phases is shown in the Fig. 1. There are number of ways ensuring immunity from the operation by magnetizing surges. Firstly the relay me be given a setting higher than maximum inrush current. Secondly the time setting may be made long enough for the magnetizing current to fall to a value below the primary operating current before the relay operates. But these simple remedies are inconsistent with high speed and low primary operating current. In the latest method, the harmonic content of the magnetizing current flowing in the operating current is filtered out and passed through a restraining coil. This is called harmonic current restarint. The high initial inrush of magnetizing currents consist of high component even and odd harmonics. Table 1 gives the typical values of harmonic contents in a magnetizing current. The operating coil carries the fundamental component of the inrush current only. The harmonic contents and fundamental together is passed through the restraining coil. Thus more the harmonic contents in the inrush current, more is the restraining torque and the relay does not operate. So use of percentage differential protection rather than simple differential protection is preferred. 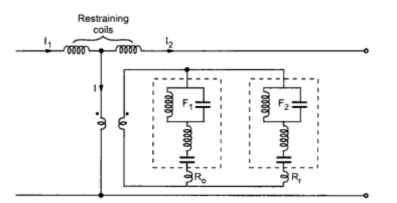 The circuit used to compensate the effect of magnetizing current using harmonic restraint method is shown in the Fig. 2. The filter F1 is designed to pass the fundamental 50 Hz component which excites the operating coil Ro. The magnetizing current has large third harmonic component. There is an additional restraining coil Rr. The filter F2 is designed to pass the third harmonic component which energizes the additional restraining coilRr. The current passing through normal restraining coil and current passing through additional restraining coil Rr produce sufficient restraining torque. This compensates for the differential current resulting due to the flow of magnetizing current. The separate blocking relay in series with the differential relay is used. The operation of this relay is based on harmonic component of inrush current. This relay consists of 100 Hz blocking filter in operating coil while 50 Hz filter in restraining coil. At the time of inrush current, second harmonic component is maximum and thus blocking relay is blocked with its contacts remain open. In short circuit case, the harmonic component is negligible and 50 Hz compensated is dominant. Hence the blocking relay operates to close its contact. This principle is called harmonic blocking.